RIO DE JANEIRO – Brazil made headlines around the world with President Luiz Inácio Lula da Silva’s recent visit to Iran, during which Brazilian and Turkish leaders helped broker a nuclear deal with the country that has been causing anxiety among the United Nations with its ambiguous nuclear ambitions. 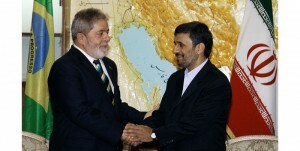 President Lula with Iranian President Mahmoud Ahmadinejad in Tehran, photo by Agência Brasil. Brazil also has been seeking to strengthen its commercial ties with Middle Eastern countries of late as an emerging economy aiming to expand its scope, reach into new markets, and establish new trade partnerships. The United States and Argentina have historically been Brazil’s largest trade partners, but China has recently risen above them. Exports have been one of Lula’s biggest priorities, closely related to his goals of economic growth and poverty alleviation, and he has been offering financing for exports while seeking to access new foreign markets through trade negotiations. Being a region home to considerable wealth and potential for mutually beneficial trade partnerships, the Middle East has now become one of Brazil’s biggest targets in this process. The country runs a trade surplus as a principal exporter of iron ore, steel, and food items such as soybeans and coffee, and their 2009 trade surplus was registered as 24.5 billion U.S. dollars, a figure that had been on the fall since 2007, mainly due to the rise of machinery imports, and more increased consumption of imported goods. Currently Brazil’s imports and exports amount to less than one percent of total traded goods for the majority of Middle Eastern countries, a percentage that leaders from both sides are hoping to increase. Despite the reputation of some Middle Eastern countries as big, worldwide exporters of oil, Brazil has been importing most of its oil from neighboring Venezuela, and traded goods between Brazil and the Middle East are mainly minerals, food, and machinery items. In recent years Lula made personal visits to a number of Middle Eastern countries, and Câmara de Comércio Árabe-Brasileira (Arab-Brazilian Chamber of Commerce) has taken on a more active role in promoting cultural, economic and tourist exchanges between Brazil and the Arab countries. 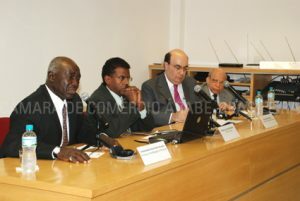 Several members of Câmara de Comércio Árabe-Brasileira at a seminar in their headquarters in São Paulo, photo courtesy of CCAB/www.ccab.com.br. Despite being the biggest economy of South America and leading the expansion of the continent’s commercial interests, Brazil is not acting alone in this matter. Mercosul, the regional trade agreement between themselves, Argentina, Paraguay and Uruguay signed a free trade agreement with Israel in 2007, and it is currently in negotiations with Turkey, Morocco, Jordan and Egypt to sign similar agreements. Brazil’s developing relationships with Middle Eastern countries, however, should not be solely attributed to economic gain, as economic stimulation and prosperity are essential vehicles for promoting peace in the region. Along with its increasing political intervention in the long-standing and sensitive issues in the Middle East, Brazil is hoping to help stabilize the region through diplomacy and peaceful means. With Brazil’s support of Iranian election results and stance against imposing additional economic sanctions against them, Lula’s position regarding Iran has been in stark contrast to that of the major Western powers, and drawing criticism as a result. Contrary to these fears, however, being an important trading partner of Israel and an ally of Iran that neither country would want to lose puts Brazil in a strong position to broker better relations between the two countries as well as gain commercially. How can the President of Brasil promise anything in a trade relationship when he has only a few months remaining in his presidency?